"Nosferatu - does this word not sound like the death bird calling your name at midnight?" If you're a fan of the vampire film, odds are you own a copy of F.W. Murnau's Nosferatu on DVD. After all, it seems like we get a new DVD of it every year. So if you clicked on this, you might be thinking, "what could possibly make me want to buy this again?" How about a stellar restoration? If that's not enough, Kino has kindly provided both an English intertitled version of the film, and, thankfully, the original German version with subtitles. Add in a couple nice bonuses, and you have one of the silent releases of the year. 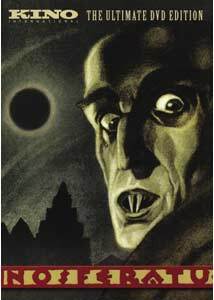 Being an adaptation of Bram Stoker's Dracula, the story of Nosferatu will be familiar to most moviegoers; real estate agent Hutter (Gustav von Wangenheim) is sent to Transylvania to deal with Count Orlok (Max Schreck), who wishes to purchase a house. Hutter, despite the serious misgivings of his wife Ellen (Greta Schoeder), journeys to the blasted landscape of the Count's domain, where he is terrified by the Count's demonic appearance. The Count, spying a picture of Hutter's wife, must have her, and the race is on to see who will survive. As noted above, Nosferatu came about as an illegal adaptation of Bram Stoker's Dracula, one which was almost lost thanks to Stoker's widow vigorously pursuing her rightful intellectual property and having almost all the prints destroyed. The film thankfully survived, and it remains one of the creepiest of vampire films to this day. Max Schreck's Count Orlok would quickly be eclipsed by vampires in a vastly more appealing mode, led by Bela Lugosi, but his performance stands apart, highlighted by remarkable makeup and Schreck's own stick-thin figure. Orlok comes across as immensely powerful and evil, something entirely Other compared to future vampires, and that makes him all the more threatening. Murnau's direction, using a variety of cinematic tricks that include stop motion, coupled with his masterful use of light and dark, add immeasurably to what might otherwise be a fairly simple shock film. Albin Grau's art direction, and the sensitive use of location, provide a realistic setting that fits the events of the film beautifully. Orlok's world is a barren, wrecked, landscape, as inhuman as its main inhabitant. This release trumpets the inclusion of the original score, one partially composed by Hans Erdmann, and partially cobbled together by Erdmann from other sources. It serves its purpose, but it doesn't do enough for me to truly serve the images. It certainly isn't the worst score the film has been paired with, at any rate. And it certainly isn't a reason to avoid this release, which is very fine. Image Transfer Review: It's admittedly been a while since I last saw a DVD of the film, but I would find it difficult to believe that Nosferatu has ever looked this good on home video. The (tinted) restoration carried out by Luciano Berriatua has left the film looking absolutely amazing, all things considered. This restoration does crop some material previously viewable in other editions, like the last Kino release. The oft-used example is the top of Orlok's head as he rises from his box of dirt on the ship; on the last Kino release, his head was fully visible and had a sliver of space above it, but on the new release, it is again cut off at the very top of his head. The film still retains odd imperfections here and there, and whether they were correctable or not, I can't say. Audio Transfer Review: The original score by Hans Erdmann gets Dolby 5.1 and 2.0 presentations here; The 5.1 track sounded a little fuller in the front speakers, but I didn't notice much in the rear speakers. Extras Review: Primary amongst the extras is a nearly hour-long documentary about the first part of Murnau's career, leading up to Nosferatu (52m:43s), titled The Language of Shadows: The Early Years and Nosferatu. I found this worthwhile merely for the various stills from several of Murnau's lost films, which each get a brief discussion. It's a bit dry, but worth a look. The restoration gets looked at very briefly in Nosferatu: An Historic Film Meets Digital Restoration (03m:14s), a short featurette that amounts to little more than a commercial for a longer, nonexistant film. Fairly pointless. Also included, and especially of interest if you haven't seen any of the Murnau's other work, are eight clips from other films by the director. Included are Journey Into the Night, The Haunted Castle, Phantom, The Finances of the Grand Duke, The Last Laugh, Tartuffe, Faust, and Tabu. The quality varies from each clip to another. Finally, a photo gallery and scene comparison wraps things up. Whether you're a horror fan or a silent film fan, or a regular film buff, Nosferatu is one of those films that just belongs in your collection. The latest DVD iteration finally provides us with a truly sterling transfer and even throws in some decent extras. An excellent job by Kino.